Whenever a marketer sits down to brainstorm website conversion tactics for a product or service, they’ll think of their different target audiences. Personalization can help to deliver a highly customized web experience for these groups, but it can be tricky to guess your customers’ every want and need - especially when you don’t have a lot of data at hand. Luckily, there’s a handy thing called self-segmentation aka self-selection. As its name implies, self-segmentation is asking your customers to tell you which audience segment they fit best. At Unless, we just released a self-segmentation add-on you can use to ask your website visitors which audience they belong to. Once they’ve made their choice, the visitor becomes a member of that audience. This takes much of the guesswork out of audience profiling. Self-selection helps you identify what they’re looking for, so you steer clear from making assumptions and help visitors find what they need more quickly. Let’s see how this works in practice. If you’re in retail, self-selection can work wonders to help people find the products they are most interested in on your site. Let’s say you run a company that sells skincare products and you offer different products for different skin conditions. When new visitors land on your site, you probably know their location and referral path. But most likely, you don’t know their gender, preferences, or needs. 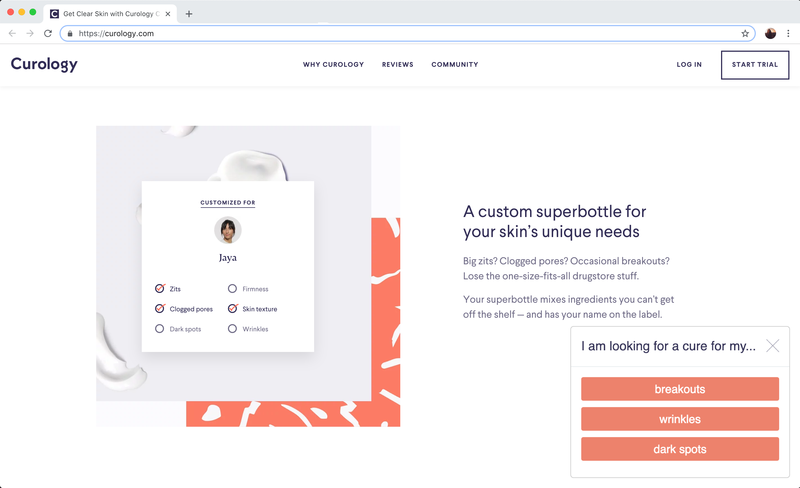 Using Unless’ self-segmentation add-on, you can simply display a small pop-up to ask them about their skin type or the products they need. That way, you can recommend and highlight products relevant to their skin care needs. Being able to quickly do that means a better user experience which will lead to more conversions, even for first time visitors. Online marketplaces typically cater to two distinct target audiences: supply and demand. Sometimes, audiences can be even more nuanced. Take a company like WeWork. They don’t only rent out work space to companies and individuals. They also rent out spaces for events. That equals three different audiences. Gathering data to properly segment first-time visitors into these categories is difficult. Unless you’ve got self-selection. With a self-segmentation add-on, you can simply ask the visitor to indicate what they’re looking for. Do you need a desk at a co-working space for yourself or do you need a larger office space dedicated to you and your team only? Or maybe you just need a venue for an upcoming event? Depending on the answer, you can further personalize their website experience by displaying only the content they care about. You can use this tool to ask for their company size, budget-range or other details as well. Let’s turn to some B2B examples. 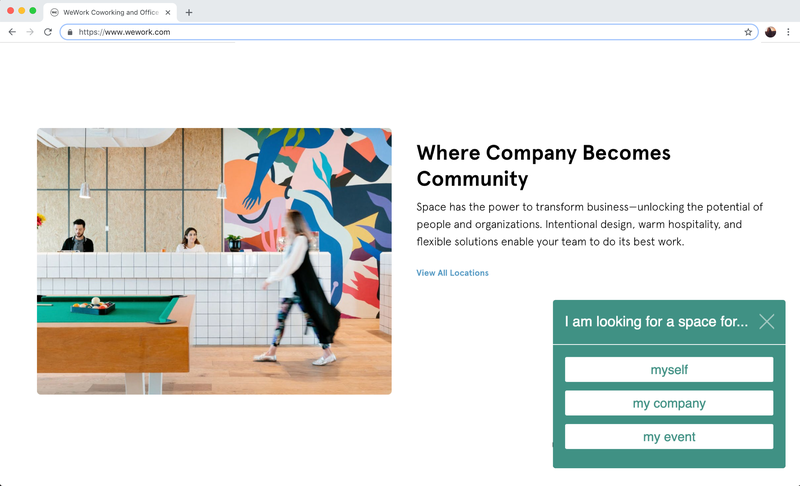 Today’s savvy B2B marketers are already gathering data to understand their website visitors, but it’s always tricky to build a complete profile of everyone who lands on your site. Using self-selection, you can ask the visitors themselves to tell you about their needs and interests in a single click. Let's say your company sells advanced analytics software for businesses in different industries. With self-segmentation, you can ask your website visitors about their industry type. Once the visitor selects an option, you can personalize their experience to highlight case studies specific to their industry or give a highly targeted product tour. You can use the same trick to self-segment by company size. Let’s assume your analytics product comes with different pricing tiers. If you deploy the self-segmenting add-on to learn about company size, you can highlight the enterprise features more prominently for those who work in large companies and do the opposite for those who have a smaller budget. The same principle can be applied to job titles. 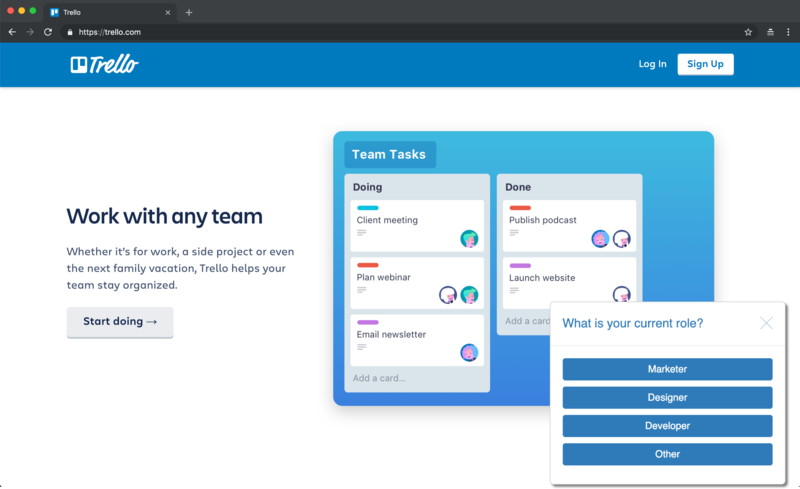 Let’s say you offer a collaboration tool that is mainly targeted at marketers, designers, and developers. Using self-selection, you can ask the visitor about their role. This allows you to personalize your content, explain your product from their perspective, and highlight the right features for the right person. A developer might be more interested in what’s under the hood while a designer is likely to care about the interface and the UX of your tool. Find out who your visitors are and you can speak their language. One of the main roadblocks for successful personalization is lack of data, but why wait to gather subtle signals of intent or make assumptions about your audience when you can simply ask a well-pointed question? Self-segmentation is easy to deploy and enables you to gather the data you need more quickly and accurately. It also gives you a better understanding of how your website traffic is composed and who your best-converting visitors are. Curious about how to apply this for your website? You should totally take a look at our setup guide for self-segmentation!